I've given you a drawing to help while doing your measurements. Not all measurements will be applicable to the garment you are making. There are a few that you will need to get some one else to assist you with. The numbers on the drawing correspond to those in the list. The wrinkle is that you will take the measurement both on your body and on the garment that either fits you already or has been pinned to fit you. You should make a chart in your note book with four columns; one for the name of the area being measured, one for your body measurements, one for the garments measurements and one for the ease difference between the two. If you aren't doing the DAL but would like to understand ease more fully, try doing this exercise with a variety of garments in your closet. Choose things in various weights from a thin machine knit to a heavy coat and see how different the garment measurements are even when they all fit in an appropriate way. 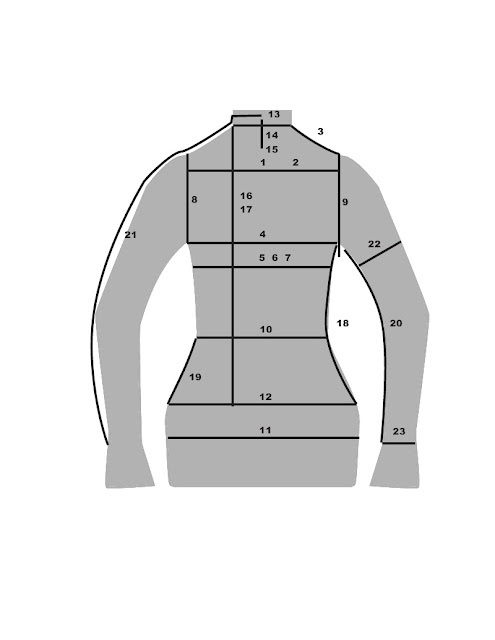 The list also includes some measurements that are broken into front and back separately, this is done to refine the fit. Current patterns typically make the front and back the same and count on the knitting to stretch to accommodate the differences. Since you are customizing it makes sense to at least consider these differences. My next DAL post will give additional details on how to take measurements. OK, that's done! I'm so excited about the next step! Sorry for being such a fangirl but I think this is really great...!! !